Flat design become popular in responsive design era because it's based on simple elements without any illusion of three dimensional space. Elements that provide the three dimensional illusion, such as borders, shadows and textures are omitted in flat designs. Therefore, flat designs are focused on a minimalist use of simple elements and flat colors. Such elements create a clean user interfaces that can be reproduced perfectly on all screen sizes. If website is based on the flat Joomla template, it will give the same feeling on all devices used to access it. The home page of the flat Joomla template is a long page with many elements that you can use or change to fit your needs or even disable. The Hot Swipe Carousel below the top menu changes the layout according to the screen space. It's can be controlled easily on touch screens with touch gestures. The main content have one column on the home page and two columns on inner pages (the right column is added). There are 2 new elements in flat Joomla template that's never used on our templates before. The first new feature is J2 Store component for e-commerce. It's a very simple and very good, 100% Joomla friendly component with ability to create the product pages from your Joomla articles. 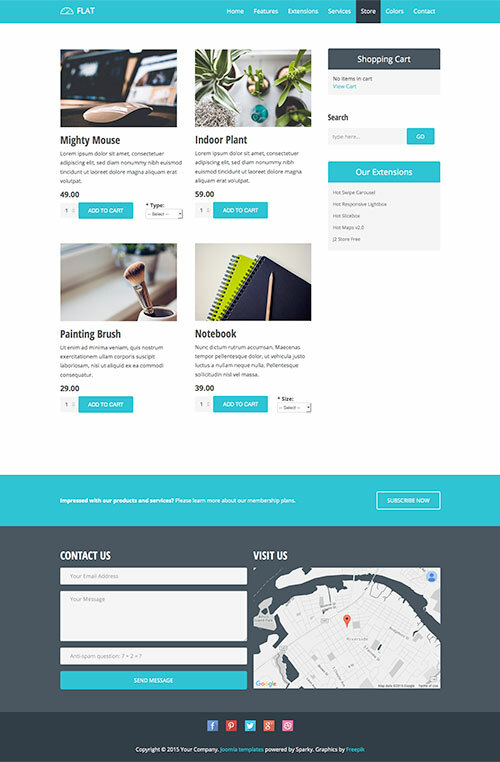 You can see how it works in the Store section of our template demo. The second new feature that you can see on this flat template are filterable content boxes. 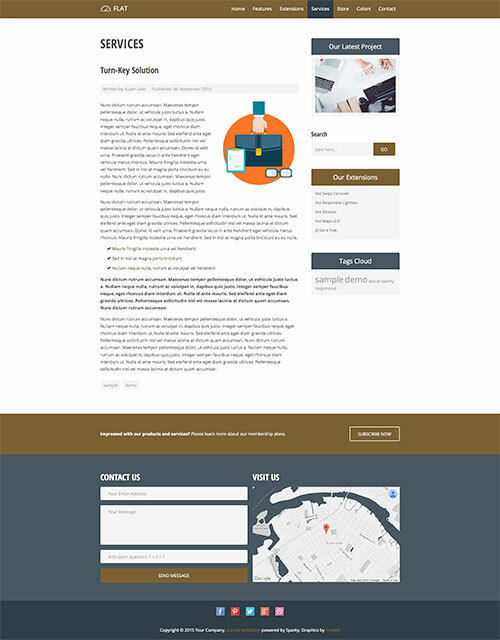 Check how they look and work under Our Portfolio section on the flat template demo. You can put any content inside the boxes and create as many categories as you need. The filterable content boxes can be used as a module (they are used like that on this Flat Joomla template) or you can include them even in your articles. Please read our tutorial about filterable content boxes in Joomla for more details. 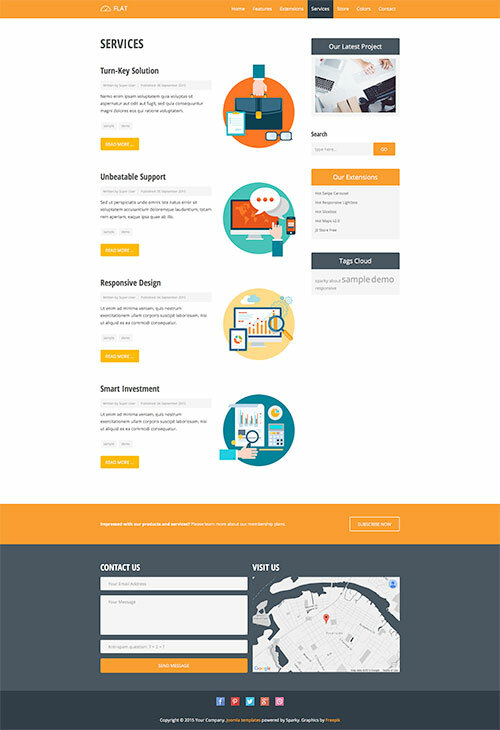 Flat template also contain a design for the pricing table. It's made as a custom HTML module, so you can change it's content easily. Another instance of the Swipe Carousel contain client's testimonials. 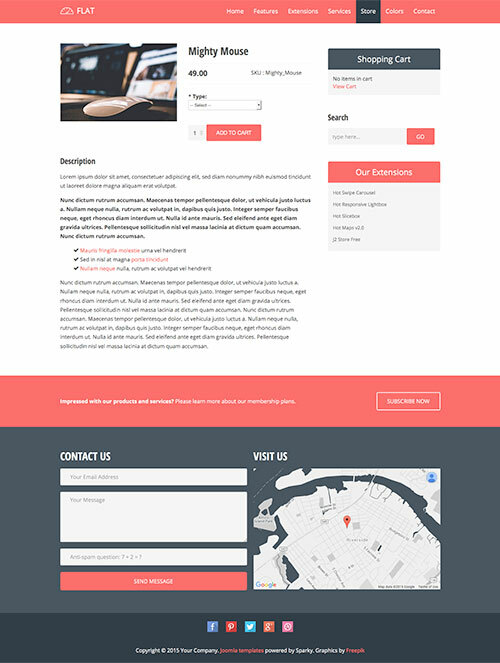 Finally, the Flat Joomla template includes a contact module (powered by Rapid Contact) and Google maps module. The maps are based on our latest Hot Maps v2.0 module, powered by Google Maps API v3.